Something interesting has happened to the bipartite formula for Sadler’s Wells’ Elixir dance festival celebrating lifelong creativity. Three year’s ago, the main stage performance Knowbody was clearly the headliner of the festival while the Extracts, based predominantly on community dance, were the supporting acts. This year the quality of Knowbody II has declined while the first evening of Extracts has shown a marked advance in mature amateur dance to a middle ground between community dance and the main stage. One of the reasons is that the current programming of Elixir has not reflected what has been happening in mature dance in the intervening three years, both in this country and in Europe. Despite Sadler’s Wells membership of the large-scale, EU funded co-operation project, Dance On, Pass On, Dream On (DOPODO), that nine dance institutions from eight countries have developed to address ageism in the dance sector and in society, this year’s Elixir has the same format, some of the same performers, and the same division between professional and amateur companies as before. While the inclusion of Berlin’s Dance On Ensemble (a professional company for the over-40s) and some amateur performances from Holland, Germany and Denmark in the Extracts are welcome, it is a shame that Charlotta Öfverholm’s company Jus de la Vie, a signatory of the DOPODO agreement, could not be included on the main stage event this year. Öfverholm’s presence alone would have countered the tiresome absurdity of Annie-B Parson’s The Road Awaits Us and the misplaced, if respectful inclusion of Robert Cohan’s Forest Revisited. And if Elixir is addressing ageism in dance, why are such artists as Wendy Houstoun and Liz Aggiss, who are battling on the same front, missing from the lineup for the second time? But there is a much larger question that Sadler’s Wells’ own flagship Company of Elders raises that remains to be resolved. There is a fundamental but vitally important distinction between presenting age on stage and celebrating age on stage. To watch Ana Laguna and Yvan Auzely on the main stage in Mats Ek’s Axe is to celebrate the unique contribution of the mature performer, and the same is true of the performance by Holland Dance of Jérôme Meyer and Isabelle Chaffaud’s My tasteful life in the first program of Extracts. It is not the difference between amateur and professional that counts but the degree to which performers can project their maturity in all its richness and complexity. This doesn’t happen, however, in Shobana Jeyasingh’s Here, choreographed for Company of Elders as part of Knowbody II; it opens promisingly with a wash of crimson costumes in glorious light but descends quickly to a composition of seated dancers waving arms, and such is the design of the chairs and the way the dancers are seated that a comparison with wheelchairs is unavoidable. This is a display of age dressed in glorious costumes and lights where the individuality of the dancers is replaced, in formal terms, by the identity of the group. If someone of Jeyasingh’s creativity cannot make a work on Company of Elders that celebrates their age, there is a problem. Perhaps the makeup of the company means she has had to create on the abilities of the weaker members to the detriment of the expressivity of the stronger ones, but no work of value can ensue from this compromise and the notion of a flagship company for mature dance sinks with it. 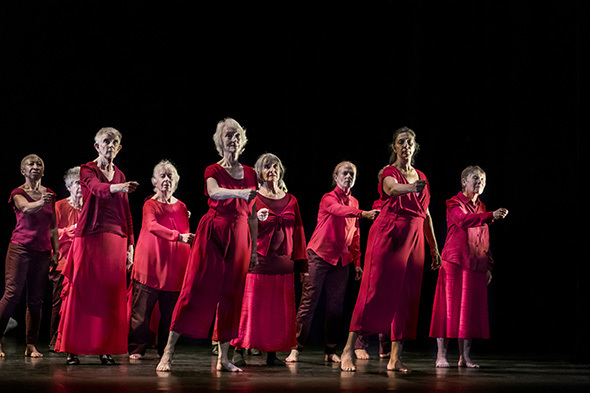 For all the advantages Company of Elders receives as the Sadler’s Wells resident performance group for the over-60s — working with renowned choreographers, a highly visible platform, touring and high production values — its qualities are no more developed than its counterparts in Brighton, Ipswich, East London and Greenwich (all of whom were presented next door in Extracts). It would seem the opportunities laid at Company of Elders’ feet are being exploited rather than fully realised. Auditions may be one way forward and a re-selection of current members according to ability. And if Sadler’s Wells wants Company of Elders to share the main stage with professional dancers, shouldn’t they, too, be paid? Another feature of this edition of Elixir that compromises its value is the presence of so many young dancers on the main stage program. Pascal Merighi, who choreographed a solo for Dominique Mercy at the last Elixir has for this one created a duet for Mercy and his daughter, Thusnelda. Why? In Forest Revisited, some of the dancers who once performed Robert Cohan’s Forest (Kenneth Tharp, Anne Donnelly, Linda Gibbs, and Christopher Bannerman, joined by a younger Paul Liburd) are seen teaching it to a new generation. Is Elixir becoming an intergenerational festival? Artistic director Alastair Spalding describes Elixir as ‘an evening featuring choreography created and danced by older artists’ while his programmers seem to be doing something else. What Extracts has confirmed, however, is that works for mature dancers are gaining in quality and interest; hopefully we won’t have to wait another three years for the next edition of Elixir festival to see mature dancers in a new category of work that is currently coming of age.